Welcome to the Information Centre for residents of YCC323. 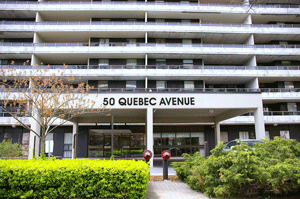 This condominium residence was completed over 38 years ago, and is registered as York Condominium Corporation 323. Many "original" residents still call it home, which is a testament to good management, good location and good neighbours. The building shares its common facilities with nine housing units on Gothic Avenue. One aspect of maintaining the community spirit of our building is good communication. This website was created to expand on the number of ways we communicate, and contains information provided by the Board of Directors, the Management Office and others about the internal workings of our community. Nothing will ever replace talking to each other, but we hope you will bookmark this site as a back-up for information about your building. Just click on the individual areas listed below and you will get a behind-the-scenes look at the workings of YCC323.